Charting a successful season can be difficult. Brands need to be able to react throughout the season, bolstering success and remaining nimble. There are many important decisions to be made on the road to success. But how do you navigate this? How do you ensure you are providing your retail partners with meaningful resources? How do you pivot and react to the unexpected ebbs and flows all season long? With Activity & Insights, brands will better understand their customers and how they are engaging with them in order to build a stronger season, all year long. Brands can easily look at key analytics for the season in a real time feed of customer engagement with the platform. Top content, top customer, showroom views, order volume - all of these analytics can be viewed, in real time, over any date range. This is a powerful, novel feature that will become an essential tool for every brand. This new feature also enables you to build on one of the fundamentals - enablement focused reps. This is now the main dashboard that reps will land on when they log into Envoy B2B. 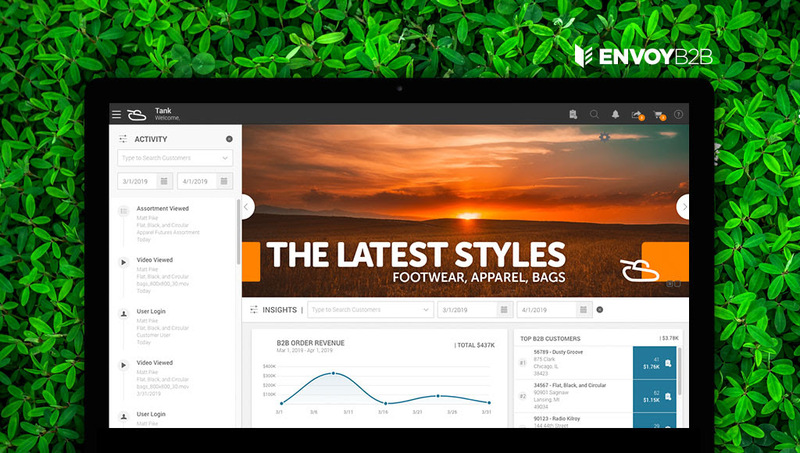 Combining the knowledge they gain from the Activity & Insights dashboard with Envoy B2B’s already existing suite of powerful content and commerce tools, reps will be able to form even stronger partnerships at retail and continue the conversation they are having with their retailers. Activity & Insights is an exciting tool and we can’t wait for you to try it out. Along with all the other great features of Envoy B2B, it will further allow brands to build strong seasons and enable their reps to build successful relationship. This new feature, along with the rest of the improvements found in V16, will release on April 6, 2019.